Barn Hunt practice. Every Friday 7:15 PM PetSaver Store, 980 Ridge Rd. Webster, NY 14580 $5.00 per dog. STAR puppy class (GSDC sponsored) Every Friday 6:00 PM PetSaver Store, 980 Ridge Rd. Webster, NY Pre-registration required, see form. 1-26 to 1-27 8:00 AM Erie Dog Shows. STAR puppy class (GSDC sponsored) Every Friday 6:00 PM PetSaver Store, 980 Ridge Rd. Webster, NY 14580 Pre-registration required. 2-2 &2-3 SOTC Rally-Obedience Trial. 3-11 7:00 PM GVKC general membership meeting. Annual banquet. 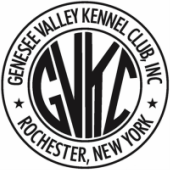 3-17 7:00 am to 6:00 pm Onondaga Kennel Club match. SOTC 6392 Deer Rd., Syracuse. See Flyer above. .
3-28 to 4-1 Syracuse dog shows. 4-19 6:00 PM STAR PUPPY class. Hosted by The German Shepherd Dog Club of Rochester, Inc.. Ends June 14. Barn Hunt practices. As scheduled. Go to Roseland Barn Hunt for event details. 5-10 to 5-12 GSD specialty shows. Lott Farms, Seneca Falls, NY See two flyers above. 5-14 6:00 PM Judging Junior Showmanship seminar. Hosted by the German Shepherd Dog Club of Rochester, NY Inc. Walworth Town Hall (basement) 3600 Lorraine Drive, Walworth, NY 14568 $50.00. See Flyer above. 7-13-14 GVKC BARN HUNT TRIAL. Saturday Crazy 8, Instinct, Novice & Open. Sunday Instinct, Novice, Open, Senior & Masters. East Wind Farm, 2019 Risser Rd. Canandaigua, NY 14424 See Trial Premium GVKC 2019 above for the premium list.